Raymond E Feist, author of the hugely successful Riftwar Cycle, will be discussing Magician’s End, the amazing conclusion to the series. The Riftwar Cycle has millions of dedicated fans worldwide, and Feist is highly admired for his amazing ability to create great casts of characters, and to keep the reader turning pages. The novels are masterpieces of intricate storytelling, with thrilling set pieces and exciting settings spanning two connected fantasy worlds. In Magician’s End, the final novel of the epic Riftwar Cycle, Feist draws to a close the series of books begun in 1982 with Magician. In this concluding book, rivals are converging on the empty throne of the Kingdom of the Isles; supernatural threats are emerging from the Grey Towers Mountains; and the mortals of Midkemia must stand together if disaster is to be averted. A triumphant and exiting finale to the saga begun with Magician in which Pug’s destiny is finally settled. 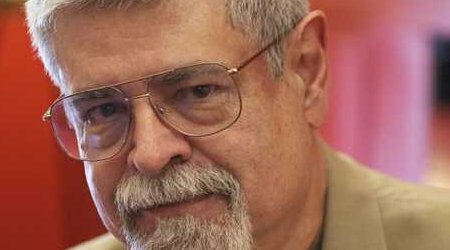 Join us for an evening with Raymond E. Feist on his first UK tour since 2009. Feist is a titan of the fantasy genre: don’t miss this rare chance to meet him.